With nearly a meter of snow at the summit, the base cover and snowfall forecasts for the next few days, Cerro Catedral start to cross the first leg of the 2010 season with good prospects for the winter starts. Even from the long weekend, visitors and residents took advantage of the first snow to enjoy the tracks that were opened in the northern sector, while pedestrians enjoyed the scenery from the balconies of Refugio Lynch and Punta Nevada and seized the opportunity to play on many occasions, for the first time in the snow of Mount Catedral, to return then to the warm interior of the shelter to invigorate and warm the body. See our Ski Packages - From U$D249 per person in double room. 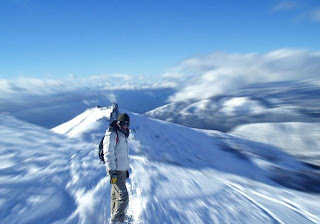 And dont loose the Bariloche Gay Ski Pack Group in September consult us for your space and prices.. Suggested: 2 night extension program for de ski you can relax and immerse in hot springs. We are certain you will get your dreamt experience in Patagonia. Here is the perfect closing nearby which could turn it truly unforgettable. Devote the time merited to yourself in a deep immersion in Nature at Lahuen Co, a boutique eco resort secluded in Lanín National Park, with a superb thermal spa. An impressive scenery made out of native forests, glacier lakes, pristine mountain streams and a variety of volcanic phenomena, is the ideal departing spot for your preferred outings, which are organized daily, from eco observation to adventure.